Search Results for "bed jump"
TOP DOWN: Young woman on relaxing holiday jumps on the bed in her hotel room. Beautiful young and slender girl happily jumps on the bed in her home shirt and shorts. Small child stands on legs in white bed, jumps and laughs. Little baby stands on legs in the bed, jumps and laughs. A young cheerful mother and her little one-year-old son are having fun at home on the bed, they jump holding hands. Mom and son in blue pajamas play in the bedroom with a modern interior. Happy children are jumping on the bed. Little sisters jump in the bedroom. 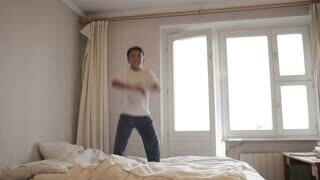 Funny mom and her little one-year-old son have fun in the morning in bed, they dance funny and jump on the bed. Portrait of happy mother and her little son at home in bedroom in pajamas. 1940s: Girl dances on bed, chandelier swings back and forth; Christmas tree shakes. Girl jumps on bed, ornaments on tree shake. Doll blown off of bookshelf by fan. Children are jumping on the bed. Two sisters jump on the couch. 8Children are jumping on the bed. Two sisters jump on the couch. Family time. Mother and little daughter jump on the bed and fight with pillows in the bedroom early in the morning. They fall on the bed and embrace. Happy childhood. Two small children jump on the bed and fight with pillows of the house in the Christmas interior. Little brothers and sister fight by cushions on the bed against the background of a Christmas tree. Woman happily jump on bed, black silhouette against bright window. Excited Kids Jumps On Bed. Parents are happy with the children. Happy Children In The Morning.